Pacific Region – Home Staging Courses coming your way! Register NOW! 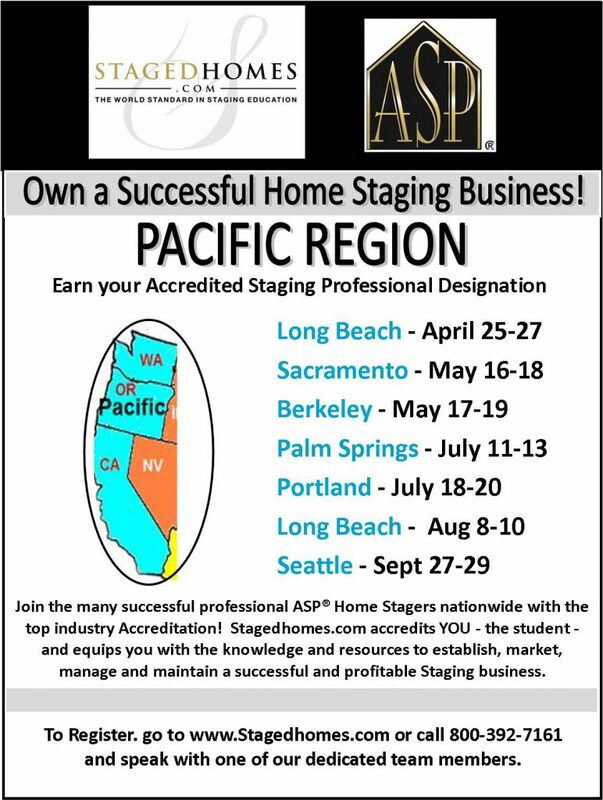 Stagedhomes.com, the World Leader in Staging Education, has classes all over the US and our LIVE monthly webinars make it easy for anyone to earn their Accredited Staging Professional (ASP) Designation and Accreditation. Check out the list of classes in the Pacific Region for Summer and Fall 2017! All graduates receive a full year membership in the International Association of Home Staging Professionals (IAHSP) – a $150 value! Go to www.Stagedhomes.com to register or call 800-392-7161 to speak with one of our dedicated team members! Ask about any specials we have to help you save $$ off your tuition! hi, can i take on line course ?. i’m living in buenos aires rigth now. Yes – you can sign up for the online live Webinar and take that from anywhere in the world. Call 800-392-7161 to get registered or go online to http://www.Stagedhomes.com and click on the link for Home Staging Training and you can register online on your own.